While running a lot of rsync instances (~45 at once... it makes sense in context) I found my ARC expanding beyond the set limit of 2 gigabytes until ZFS deadlocked - almost all rsync processes hung in the D state and some kernel threads as well. A reboot was necessary. It only took about 5-10 minutes of this kind of pressure to break. 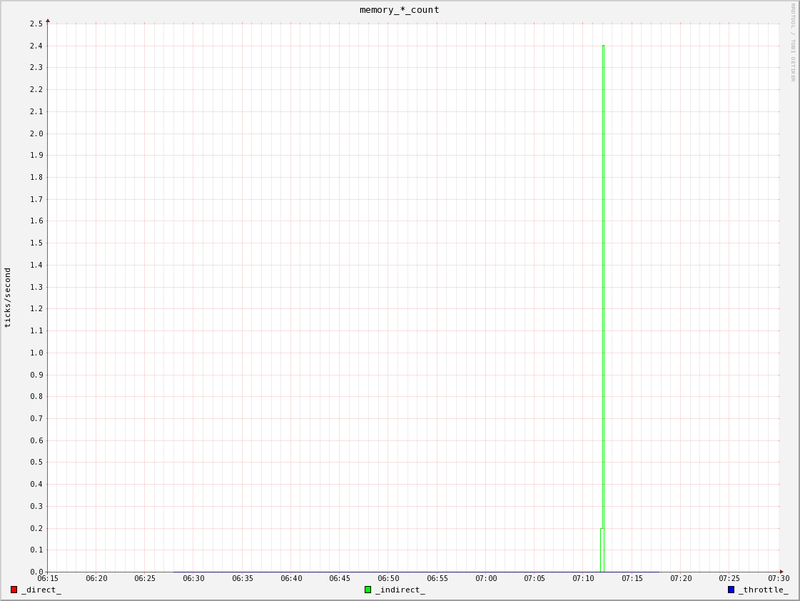 Not too long after all ZFS-involved processes froze up. I've also tried using the module/zfs/arc.c from #669 for testing and reducing the ARC size. RAM usage still exceeds the limits set. Nevertheless it's been running for a few hours now reliably. Unfortunately, I seem to have given you the wrong pull request number in IRC. The one that you should have tried was #618, not #669. How did you manage to create pool version 26 with zfs-fuse? Perhaps it is a typo and he meant pool version 23. I was going to suggest that you try the patch in issue #618 but you beat me too it. I'm a bit surprised that it doesn't resolve the issue, clearly there's more to be done. I haven't had the chance to apply #618 yet. I'll try it tomorrow, time permitting. These outputs are all taken after ZFS jammed up. Stack traces, some are additional kernel threads. zfs-fuse has pool v26 available in the Git repo. We're working on some spl kmem improvements which may help with this. Expect patches in the next week or so. Two cases have been identified which can result in memory reclaim from the slab being less the optimal. I'm also experiencing this exact issue when attempting an rsync. Has there been any progress; is there anything I should try? I'm running 0.6.0-rc8 on Debian wheezy/sid using the deb instructions on the website. Several patches which should help with this have been merged in to master post rc8. Please try the latest master source. Additionally, you can try increasing /proc/sys/vm/min_free_kbytes to say 256m or so. I was actually just looking at #154 and it seemed to be related, and was just looking for confirmation that I should indeed try the latest master. So, thanks, will do, and will report back. @jspiros Is there anything useful being output to dmesg? You might want to run sysctl kernel.hung_task_timeout_secs=15 to reduce the amount of time it takes for the hang check timer to report hangs to dmesg from 120 seconds. This requires that your kernel is compiled with CONFIG_HANGCHECK_TIMER=Y. @ryao Indeed, there were many hung tasks, even with the default of 120 seconds. The first three were kswapd0, arc_reclaim, and rsync, though many others hung after that. I'm currently running the latest master, and I set min_free_kbytes to 256MB as recommended, but if you tell me what information you want should the same problem occur again tonight (I have some rsync backups that run nightly), I'll try to get it here. I was able to run some commands as root, including dmesg, so just tell me what would be helpful and I'll be sure to get as much information as I can. The hung task information in the dmesg output would be useful. Arc size 2^31 bytes. It's the same setup from my first post. I caught it before it the OS threatened to lock up and SIGSTOP'd all my rsync processes. While it was paused the arc 'size' was slowly dropping and I resumed once it got below 1.6G. Right now the size is 2,718,915,552 and still climbing unless I stop it again. @behlendorf Your suggestions helped me make it through the nightly rsync, and everything seems to be working fine. @ryao Due to this, I'm afraid I do not currently have any dmesg output for you (yet). If something goes wrong again, I'll provide it, of course. @jspiros That's good news. The hope is that going forward some of Richards VM work will remove the need for this sort of tuning but we're not quite there yet. I (partially?) retract my previous post. I left the rsync running so it would presumably ruin the system, but it didn't die. That was some hours ago and the ARC is now restraining itself at about 570-580 megabytes. I'm turning up the heat a bit to see if I can coerce a useful stack dump out of it or find out if it properly behaves now. Edit: after turning up the pressure the ARC did eventually grow to the breaking point. It seems to fare better but still cracks under intense pressure. Okay, well, this morning was doing alright until just now. It probably doesn't help that I decided to scrub my pool, which will take about three days (18TB in [usable] capacity), overlapping with the nightly rsync. Here's what dmesg is looking like right now. [161160.692017] INFO: task kswapd0:33 blocked for more than 120 seconds. [161160.692055] "echo 0 > /proc/sys/kernel/hung_task_timeout_secs" disables this message. [161160.692258] INFO: task arc_adapt:954 blocked for more than 120 seconds. [161160.692281] "echo 0 > /proc/sys/kernel/hung_task_timeout_secs" disables this message. [161160.692546] INFO: task txg_quiesce:1178 blocked for more than 120 seconds. [161160.692570] "echo 0 > /proc/sys/kernel/hung_task_timeout_secs" disables this message. [161160.692693] INFO: task avahi-daemon:3937 blocked for more than 120 seconds. [161160.692718] "echo 0 > /proc/sys/kernel/hung_task_timeout_secs" disables this message. [161160.692917] INFO: task ntpd:4648 blocked for more than 120 seconds. [161160.692939] "echo 0 > /proc/sys/kernel/hung_task_timeout_secs" disables this message. [161160.693135] INFO: task radvd:4719 blocked for more than 120 seconds. [161160.693157] "echo 0 > /proc/sys/kernel/hung_task_timeout_secs" disables this message. [161160.693308] INFO: task dropbox:4920 blocked for more than 120 seconds. [161160.693331] "echo 0 > /proc/sys/kernel/hung_task_timeout_secs" disables this message. [161160.693492] INFO: task irssi:7797 blocked for more than 120 seconds. [161160.693514] "echo 0 > /proc/sys/kernel/hung_task_timeout_secs" disables this message. [161160.693679] INFO: task java:598 blocked for more than 120 seconds. [161160.693700] "echo 0 > /proc/sys/kernel/hung_task_timeout_secs" disables this message. I will try to avoid rebooting the system, in case anyone has any suggestions that might resolve this problem online. Update: Nevermind, I realized that with kswapd0 in deadlock it's highly unlikely that there's anything I could do to fix this problem without a reboot, so I rebooted. On an unrelated note, I'm happy to see that the scrub is continuing from where it left off. While using ryao's "gentoo" branch of his own fork here on on github I killed the same machine again. Here's more data dumps. After talking with ryao in IRC I've been asked to add a few points to this issue. The 'size' field from the kstats for the ARC, during heavy IO, just grows past the c and c_max fields, but it also seems to have some kind of background job that is draining the ARC at all times to around 512 megabytes. When completely idle, the size just shrinks mysteriously. When under relatively light load, it may float in place but still stay under c. It seems to stop shrinking at about 512 megabytes whether idle or not. I'd guess that under heavy load the background shrink just isn't keeping up with the foreground fill. As a hack I can keep the system stable by SIGSTOP'ing all the rsync processes if the size gets dangerously high (my breaking point seems to be around 3.3 billion bytes) and SIGCONT once it's fallen back down again. After switching to vm.min_free_kbytes = 512M from 256M I've been able to survive the nightly rsyncs, however, now I'm running into exactly the same problem except with CrashPlan (a java application for remote backups) causing it instead of rsync. Exactly the same problem in that kswapd0 deadlocks followed by arc_reclaim and then everything else. I needed to get the system back online and neglected to copy the dmesg output, but I confirmed that it is essentially identical to the previous output from the rsync-caused problem. I am hesitant to turn CrashPlan back on until there's something new to try. Still trying to collect useful information. I set the arc_max to 256 megabytes just for experimentation. It still deadlocked. Two sets of stack traces are provided, set about 2.5 hours apart. The first is from long after the system had hung - I don't know when that actually happened. I turned on debugging and turned off a bunch of compiler optimizations and locked it up again the same way. These stack traces look a lot nicer to decode. After speaking with @DeHackEd on IRC about the cause of this problem, I tried limiting the queue depth (to 16 from 32) on the SATA drives that make up my pool using hdparm. I experienced success with this, in that I survived the night with both CrashPlan and the nightly rsyncs running. This isn't a long term fix, as it does slow everything down, but if someone else is in a situation like mine, it might help until this issue is solved. The crashing/deadlocking side of the issue is apparently fixed by https://bugs.gentoo.org/show_bug.cgi?id=416685 (which I applied and cleaned up for kernel 3.0.x). Now it can run for over an hour with nothing controlling its execution speed. I'll update if anything goes wrong on me. While running in this mode the ARC appears to behave itself better with regard to following the c value. This is just a rough observation right now as the ARC size is unlimited and generally can't reach the maximum due to memory usage. That said I did witness c shrink below c_max and the size was generally following the new c value. This is just one brief observation though - more grinding is required. Note: I am currently using ryao's 'gentoo' tree. The memory management and swap improvements in issue #883 have now been merged in to master and should remove the need for the kernel vmalloc() patch. If you could verify these resolve your issue I think we'll be able to close this issue. I can try installing it probably on Tuesday, but it may be a few days before the result is yay/nay. 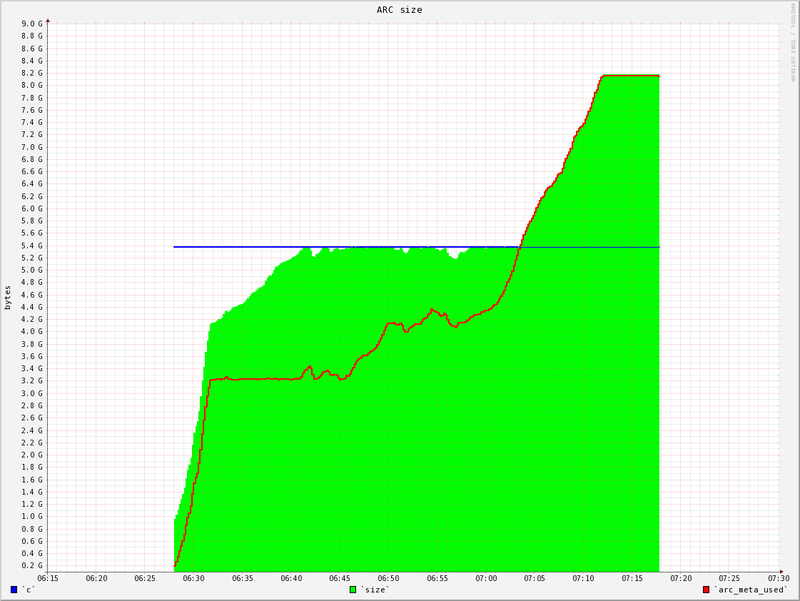 Under heavy load (~ 60 rsyncs) ARC grows over limit. The system freezes for a short time and performance degradation occure. In the end, the system hangs. Tested on the latest version from git. I tried to reproduce this bug in a virtual environment, but everything worked correctly. I think the reason this is a lot of metadata. I have several backup servers with pool sizes from 1-4TB. On each of them ~ 1000 datasets with snapshots. And each of them has this bug. To reproduce it enough to run parallel find on all datasets. I must periodically run echo 3>/proc/sys/vm/drop_caches to clean memory, but it does not always help. How can i help you to resolve this issue? I have asked him to test it. The current version of the ZFS ARC splits the lists above into separate data and metadata lists, and also has a list for anonymous buffers and one for L2ARC only buffers (which I added when I developed the L2ARC). Nexenta by default allocates 1/4 of your ARC cache (RAM) to metadata caching. Your L2ARC map is considered metadata. 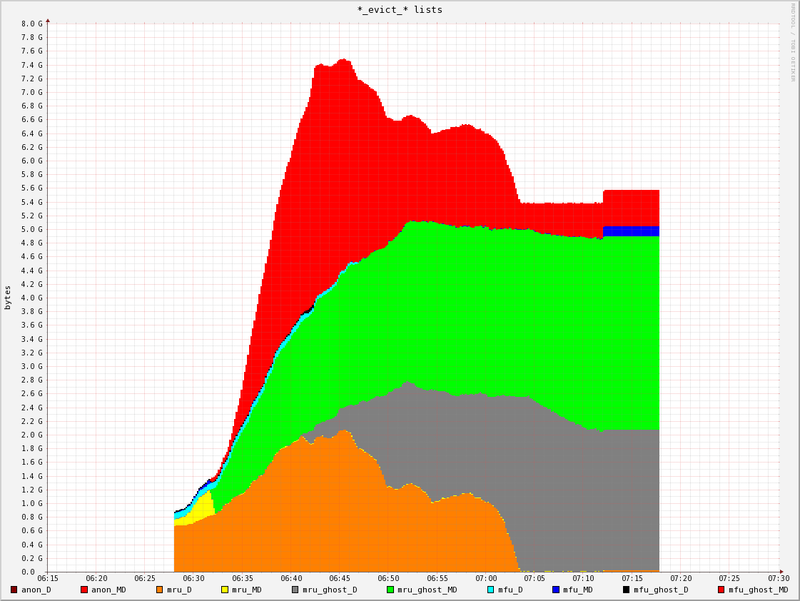 It feels to me like memory management of the L2ARC map is not being done correctly under sustained load conditions. @ryao @DeHackEd Ahh! That makes perfect sense. Now I'm kicking myself for not exposing the l2c_only arc_state_t in arcstats when I originally did it for the other arc states. The above patch corrects that issue. Can you please give it a try and verify that the new l2c_only_* entries in arcstats account for most of the ARC meta data. Now exactly what do it about it is a different question. At the moment there is no mechanism for memory pressure on the system to cause these headers to be evicted. Doing so would effectively abandon the data buffers in the L2ARC. This is safe to do but not exactly optimal for performance. There is probably a case to be made that this is preferable as a last resort when the system needs memory. In my case l2 cache is not used. I did some traces and found that the function arc_adjust_meta from arc_adapt thread does not release memory under heavy load. And ARC continues to grow. @arp096 You have a different but equally interesting case. In your case the limit was exceeded because very little of your meta data can be safely evicted, it appears that most of it is of type "other". This likely means it's holding dnodes and bonus buffers for lots of active files. I would expect that when you back off the workload it quickly brings the usage under control? In most of the arcstats being shown here, L2ARC does not appear to be used. It is only the most recent one from @DeHackEd that shows use. This issue could be describing two separate issues that happen to have the same symptoms. @behlendorf Yes, that's right. And bug is not present if the parallel rsync processes is less than ten. That does describe my situation somewhat as well. When the number of rsync processes is relatively low (best guess of the maximum safe range is 10-15) the system is stable and the ARC size is honoured, L2ARC or not. When It's much higher (around 20 maybe?) I do get the memory usage problem. What I can't be sure about is how L2ARC factors into things. After @ryao asked me to try stressing it with the L2ARC removed I wasn't able to. Just now I've tried putting medium pressure on (10 rsyncs + send/recv) with the L2ARC and it starts tipping over sometimes (4300 MB of ARC used out of 4096 allowed, just floating above the line but clearly moreso than should be tolerated). Remove the L2arc yet raise the pressure (15 rsyncs + send/recv) and it behaves much better. I always assumed the cache was responsible for changing the load average from 15 processes in the D state most of the time (waiting on the disk IO) to 15 processes in the D state a lot less of the time (not waiting so much) but now I'm completely confused. It is strange that the metadata cache continues to grow even when turned off. It doesn't help that "metadata" is rather vaguely defined in this context. i had the same issue, when i run several rsync's in a 1TB pool under KVM-qemu system (VM) I could see on the host that my virtual machine was eating all the cpus assigned to it. i limited ARC memory 2 days ago and everthing looks good for now. Besides I'm using Dedup in this pool, I've been reading about it and I understand it uses up to 25% of this memory. I calculated the amount of neccesary memory to keep the dedup table within the ARC memory. my question is : Does DDT table stay in this memory? Here's my most recent run of the backup cycle, which wasn't even at full speed ("only" 15 copies of rsync) and it crashed in record time. This time I was graphing a whole bunch of the arcstats from the spl data. Data polling interval is 10 seconds at the RRD level. @DeHackEd When you say it crashed do you mean the system paniced or became unstable in some way, or that we just exceeded that meta limit? I believe I see why that's happening now regarding the meta limit but I'd like to better understand the instability your referring too. @DeHackEd Can you please try 6c5207088f732168569d1a0b29f5f949b91bb503 which I believe should address your issue. Basically it was possible under a very heavy meta data workload to move all the meta data just from the MRU/MFU on to the MRU/MFU ghost lists. It would then never be free'd from there if there was data on the ghost list which could be reclaimed instead. I'd be interested to hear if this change improves your performance as well. While it does seem to help, it hasn't completely eliminated the issue. At best it just delays the inevitable. Yet more output from arcstats, /proc/meminfo and some IO stats, immediately before and after doing a drop_caches after I started hitting the redline of memory usage. A workaround for issue #1101 seems to fix this issue as well under my typical workload. Yes, this workaround works for me. But I set ZFS_OBJ_MTX_SZ to 10240. It works fine with ~500 concurrent processes. Thank You! I'm closing this long long long issue because a fix was merged for the deadlock, see issue #1101. The remaining memory management concerns I'll open a new more succinct issue to track. @behlendorf: Do you have a reference to that new memory management issue? See #1132, it's largely a place holder.